Luck and Perseverance Gill Davies presents some of her recent finds and some fascinating research on the heraldry of a 12th century pendant. A Roman Bravery Award Mike Turner unearths a very rare Roman armilla in Norfolk. Up Periscope Read Jonathan Bull’s account of finding a bunker periscope plug on a Jersey beach. Finds from the Old Moat of Delft Mart Hoffmann has the chance to detect soil from a medieval moat resulting in some wonderful finds. History Through a Camera Lens Jason Sandy presents some stunning and unusual photos of mudlarking finds taken by Hannah Smiles for her exhibition at The Totally Thames Festival. Spotlight on PAS Finds Ciorstaidh Hayward-Trevarthen, Andrew Williams and Laura Burnettl ook at a selection of the most interesting artefacts recorded with the South West Region of the PAS over the past 15 years. A Year With My Deus Lite Bob Hall’s adventures during the first year with his new Deus Lite. The Dig Duo Trish Ostrowski looks back at the best rally finds made with her husband Mike. 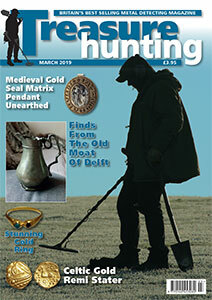 A Knight, a Monk and a Dog Neil Tylerand his remarkable detecting dog Jodie dig up some very interesting medieval finds. A New Permission Andy Haller’s new field produces a great selection of finds from the Roman period onwards.